sritchhart added images to a gallery album in BMT Member's Gallery - Click here to view our member's albums! I have a 87 superliner. Thanks I enjoyed looking at that! 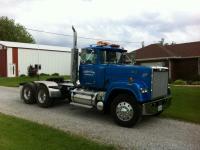 I have a 1987 Superliner with a 12 speed. It does not shift into high side when the transmission is cold. After I run it for an hour or so it will click into high side on all the gears, and run fine the rest of the day. What can I do to fix this issue, or should I take it to the Mack dealer? Any thoughts would be appreciated. Thanks! Thanks for all the input. Sounds like the 12 speed will be fine for me. I think it will be perfect for short halls, but allow us to make longer trips if needed. Our 82 mack with a 5 speed only tops out at 55 so it will be nice to have the extra speed in the superliner. I am looking at a 87 superliner, camelback, 100k miles, with a 12 speed transmission. Would this be a good transmission for hauling grain on short trips (5 to 20 miles)? I had a friend say they can give some trouble. How reliable are they? We will prob. only put 4k miles a year on the truck. Thanks!